A broken connection: When a person has a disjunction, then things are not joined together and there is a disconnection. Disjunctions indicate that there are no links between things that should have relationships in some way. 1. Dark and gloomy; dreary: Mark and Sam were visiting a damp and dismal cave during their explorations. 2. Relating to being depressed and miserable: The nurse noticed how the patient's sickness was making him feel dismal. 3. Descriptive of being very bad, poor, or disaster: The drama that was presented turned out to be a dismal failure. 4. Etymology: from Latin dies mali, "evil days"; via Anglo-Norman dis mal; literally "evil days"; used to indicate two days in each month that, according to ancient superstitions, were supposed to be unfortunate or unlucky days. The term dismal became known as being a day of "gloom" and "calamity". There is further information with illustrations about dismal on this page. Referring to something that is terrible or dreadful: Jim dismally failed his final exam and so he was very gloomy and depressed. 1. To take apart, to disassemble, or to tear something down into its constituent pieces in a way that causes it to stop working: The auto mechanic dismantled the engine so he could repair it. 2. 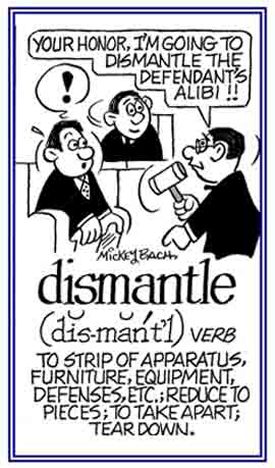 To destroy something by removing key elements; such as, an institution or system by removing its essential parts: The school program was dismantled because there was a lack of funding. 3. To strip a room or a building of its furniture or equipment: The buildings were dismantled so they could be demolished and new constructions be done to replace them. 4. Etymology: from the 1570's, from Middle French desmanteler, "to tear down the walls of a fortress", literally, "to strip off a cloak"; from des-, "off, away" or dis-, "apart, lack of, not" + manteler, "to cloak, to mantle". © ALL rights are reserved. Showing page 18 out of 35 pages of 513 main-word entries or main-word-entry groups.